Notice how the headline doesn't say "the Lost Planet 2 co-op demo"? That's because PlayStation 3 owners are getting an expanded demo on the PlayStation Network tomorrow, September 24th. 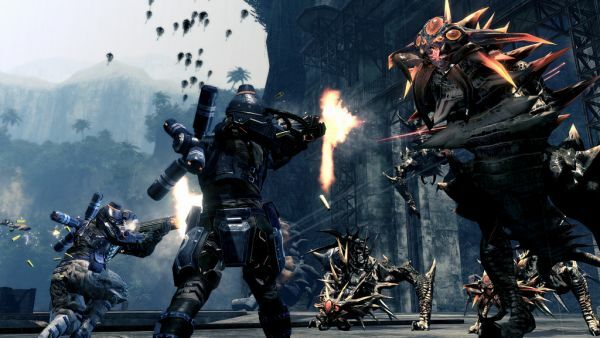 PS3 owners will not only be able to engage in the frantic battle against the enormous G-Type Akrid, the boss Akrid of the episode 1, but will also get the exclusive experience of two additional missions in an online co-operative extermination of the Akrid of E.D.N. III. In addition to the demo, an exclusive trailer will debut on the PSN, which promises to show off a new desert environment and "even bigger Akrid than seen before". Thanks to Colony of Gamers for tipping us off! Page created in 0.2510 seconds.